Come along on a whimsical photo journey through the wonderful world of tropical fruits. From açaí to tamarind, there's sure to be a fruit for everyone. Learn their origins, basic growing facts, uses and more! Fruit: The fruit is round or oval and 1.5-4" long. The skin of abiu is yellow and the flesh is white. Each fruit can carry 1-4 seeds, and fruit must be fully ripened before using, as it contains latex until the ripened point. Height: Over 30 inches and can reach over 100 inches tall in the right conditions. Hardiness: This is a tropical tree and will be killed if temperatures fall below freezing. Propagation: Abius are grown from seed, grafted or budded. Uses: The abiu is eaten fresh. It can also be used in ice creams, ices, and sorbets. Continue to 2 of 61 below. Fruit: Dark purple 1" berry. The fruit is produced twice yearly, and each tree may have thousands of fruits yearly. Height: In the wild, the acai palm will grow 40-90'. Cultivated varieties are somewhat shorter, especially if grown in pots. The palm will begin producing fruit once it is about 6' tall. Uses: Acai juice and pulp is becoming a popular ingredient in health and diet products. The taste is berry-like with hints of chocolate. Continue to 3 of 61 below. Fruit: The fruits are 1" and bright red. There can be 1-3 harvests per year, depending on the climate, although warmer is best. Each tree will produce 30-60 pounds of fruit. Height: The acerola grows up to 15'. Hardiness: Acerola does not do well in the cold. Full-grown trees can survive rare freezing periods, but they will lose their leaves. Uses: Acerola is often used as a Vitamin C supplement. It is also used in one flavor of Absolut vodka (Absolut Los Angeles) and Tic Tacs. The fruit is tangy and can be sweet or sour. The acerola tree is also a popular choice for bonsai. Continue to 4 of 61 below. Fruit: The 2-4" fruits are an orange-red. The fruit needs to be ripe before eating or it may cause vomiting. Wait until the fruits split open before eating. The fruits are related to the longan, lychee, and rambutan. Size: The ackee grows 33-40' tall. Hardiness: Mature trees can survive brief freezing periods. Uses: Ackee is the national fruit of Jamaica and part of the national dish "Ackee and Salt Fish". It is said to have a flavor similar to eggs and nuts. In Africa, the ackee is used in soups or fried in oil. In some areas, ackee is used as soap. The ackee is in the Sapindaceae family, which means it contains saponins, a natural detergent. The strong wood is immune to termites and often used in small lumber projects. Medicinal uses include treating parasites, dysentery, headaches, ulcers, epilepsy, eye infections, and pain relief. Continue to 5 of 61 below. Other Names: Ornamental banana (Ensete spp.). Also see finger bananas and plantains. Fruit: The standard cultivar sold in the United States is the 'Cavendish'. Bananas may range from 2.5" (finger bananas) to 12" (plantains), with an average size of 6-8". Size: Banana trees can be up to 25' tall. Hardiness: The edible bananas do best in zones 9-10. There are ornamental varieties that are cold hardy if you want a tropical look for your temperate garden. Uses: Sweet bananas are eaten raw or cooked. Plantains are starchy and should be cooked before eating. Continue to 6 of 61 below. Fruit: The fruits are 1.5-4" long and white to yellow-green when ripe. It is related to the carambola (star fruit). Size: This tree grows 15-30' tall. Hardiness: The bilimbi is hardy to the freezing point, 32°F. Uses: Bilimbi is used to flavor fish and meat. It can also be found in drinks and jams. It is too acidic to eat fresh. Continue to 7 of 61 below. Fruit: Black sapotes are 3-4" long and green. The black refers to the pulp. It is related to the persimmon. Size: The tree can grow up to 80' tall. Hardiness: As long as the tree is mature, it can survive as low as 28°F. Uses: Black sapote can be eaten raw or used in desserts. Continue to 8 of 61 below. Fruit: The 1" lobed fruits are red-black when ripe. Hardiness: When the Brazilian cherry tree is fully mature, it can survive down to 22°F. Uses: Brazilian cherry can be eaten fresh or made into jams and jellies. Continue to 9 of 61 below. Fruit: The yellow-green, round fruit is up to 8" in diameter. It is closely related to jackfruit and marang. The fig tree is a distant relative. Size: The breadfruit tree can be as tall as 90'. Propagation: Suckers, root cuttings. The breadfruit is seedless. Uses: Just before the breadfruit ripens, it can be used as a vegetable. Once it is ripe, it is used in a wide variety of dishes. Continue to 10 of 61 below. Fruit: The large brown pods are 5-12" long and 3-5" wide. Size: The cacao tree is small, about 10-20' tall. Hardiness: This fruit can only be grown in a tropical location. It will perish if temperatures are below 40°F or above 100°F. Uses: Almost all of us are familiar with the main use of cacao for chocolate. It is also the source of cocoa butter, and some eat it fresh. Continue to 11 of 61 below. Fruit: The star-shaped carambola is 2.5-6" long and orange-yellow when ripe. It is a relative of the bilimbi. Size: This tree grows from 20-30' tall. Hardiness: The carambola can grow in zones 10-11. Propagation: Grafting is preferred since the tree fruits much earlier (in 1 year) than in the 4-6 years it can take for a tree, from seeds, to bear fruit. Uses: The carambola is used in fruit salads and desserts for its star shape. It can also be eaten fresh. Continue to 12 of 61 below. Fruit: The 4-12" pods are brown and contain 10-13 seeds. A distant relative is tamarind. Size: The carob tree is usually 30-50' tall. Propagation: Seeds. This tree is dioecious and both male and female trees will be needed. Uses: Carob is lower in fat than cacao, and it is often used as a chocolate substitute. Extracts from the seeds can also be used as thickeners in cooking. In Germany, a coffee substitute is made from the carob seeds. In ancient times, the carob seed was used to measure the worth of gems and gold since the seeds have a general uniform weight. This is where the word "karat" comes from. Continue to 13 of 61 below. Fruit: The true fruit is the gray nut (drupe) on top. The apple-like bottom portion is a swollen stalk, a false fruit also known as a pseudofruit, accessory, or receptacle. The cashew is related to the mango and both belong to the sumac family. The shell of the cashew is toxic, thus special roasting and shelling procedures must be followed for safety. Size: The tree grows 35-40' tall. Hardiness: Cashews will be severely damaged if the temperatures fall below freezing. Propagation: By seed, budding and air-layering. Uses: The cashew nut can be used after special processing. The cashew apple can be eaten fresh, juiced, preserved in syrup or dried. The juice contains tannin, which should be removed to prevent possible nutritional deficiencies. The cashew apple is used in some countries to treat a sore throat, dysentery, rheumatism, neuralgia, and as a diuretic. Continue to 14 of 61 below. Fruit: The cherimoya is large, green and heart-shaped and is often between 4-8" long and up to 5 pounds. It is generally described as having a pineapple or banana flavor. Mark Twain once declared it, "The most delicious fruit known to men." The cherimoya is related to the custard apple, guanabana, and sweetsop. Size: The cherimoya tree grows over 30' tall. Uses: The cherimoya is eaten fresh. Continue to 15 of 61 below. Latin Name: Citrus spp. and Kumquat, the latter which is very closely related and has been given the genus Fortunella spp. Fruit: The citrus fruits come in all sizes and shapes. There are about 14 common types of citrus found in U.S. stores. Size: Citrus can grow on large shrubs or trees. The size will vary by species. Hardiness: Many kinds of citrus can grow in zones 9-11. Uses: Citrus can be eaten fresh or used in cooking. Some are too acidic to eat fresh. Citrus fruits are quite rich in Vitamin C and were used by sailors to ward off scurvy. Orange oil is used in many cleaning products. Continue to 16 of 61 below. Native to: Unknown. The coconut palm can still germinate after months floating in the ocean, so it is difficult to determine the origin. Fruit: The coconut we know is actually the seed of a drupe, similar to the pit of a nectarine or cherry. The outside is covered in fibrous layers. Coir, which used in gardening, is taken from these outer layers. Size: The coconut palm tree is 20-50' tall under cultivation, and can reach as tall as 100' in the wild. Hardiness: Zones 10-11. Coconut palm trees are very tropical and cannot tolerate frost. It will also die if exposed to degrees under 50°F for too long. Propagation: Seed. It will take 5-6 months before it will germinate. Uses: A hole can be cracked in the coconut and the milk can be consumed fresh. The inside white meat, copra, is used in a multitude of recipes. Oil can be extracted for many uses. Continue to 17 of 61 below. Latin Name: Almost all commercial coffee is made from Coffea arabica, the "Arabian coffee". Coffea canephora is also used to produce the "robust coffee". Native to: Coffea arabica - Ethiopia. Coffea canephora - Liberia to Congo. Fruit: The red fruits are berries. The two seeds inside are roasted to become the familiar coffee bean. Size: The coffee tree will grow, on average, to 10-20' tall. Hardiness: Coffee is commercially grown in Hawaii and Puerto Rico as it is too cold elsewhere in the U.S.
Propagation: Arabica - seeds. Robust - cuttings. Uses: Most coffee beans are used for coffee drinks, though some are used as flavorings. Coffee trees produce the second largest commodity product in the world. Continue to 18 of 61 below. Other Names: Bullock's Heart. The name custard apple is used for several related fruits. Relatives include the cherimoya, atemoya, soursop, and sweetsop. Fruit: The brown or red fruits are 3-5" long and contain many seeds. The flavor is usually not considered as good as its relatives. Size: The custard apple tree grows to 20-35' tall. Propagation: Seeds, air layering and grafting. Uses: The custard apple is eaten fresh. Continue to 19 of 61 below. Fruit: The date palm is dioecious. Both male and female plants are needed to produce the 1-3" brown fruits (drupes). Size: The trees used commercially grow to 30' tall. In the wild, they can reach 60-100' tall. Uses: Dates can be eaten fresh or made into pastes, juices, and syrups. Continue to 20 of 61 below. Fruit: The pink, round, scaled fruit can be up to 5" long. The flesh inside can be white or magenta. Other pitaya species may have golden skin and flesh. There are numerous tiny black seeds. Size: The cactus vines can be up to 20' long. Uses: The dragon fruit is usually eaten fresh and chilled. It can also be used to flavor desserts. Continue to 21 of 61 below. Fruit: The oval, spiny fruits are 6-12" long and can weigh up to 18 pounds. The fruit is known as the "king of fruits" in Asia. People usually either love it for its nutty, caramel flavor or hate it due to its intensely unpleasant smell. Some businesses even ban the consumption of the fruit indoors. Hardiness: The durian is quite tropical and will be killed if the temperatures drop below 40°F. Uses: The durian is mostly eaten fresh. It is also used in various desserts. Continue to 22 of 61 below. Fruit: Feijoa fruits are .75-3.5" long with green and blue-green waxy skin. The fruit tastes like combinations of guava, pineapple, strawberry, and mint. Both the flowers and fruit have a strong, pleasant scent. Size: The feijoa can grow 15-25' tall. Propagation: Seeds, which may take weeks to germinate. Continue to 23 of 61 below. Fruit: The fig is a type of fruit called a syconium. The thick skin can range from green to brown, to purple. The pulp inside has the texture of jelly. The fig is distantly related to breadfruit, jackfruit, and marang. Hardiness: Zones 8-10. There are varieties that can be grown as low as zone 5. Uses: Figs can be eaten fresh, dried, and used in desserts. Continue to 24 of 61 below. Uses: Finger bananas can be eaten fresh or used in desserts. Continue to 25 of 61 below. Size: Most are shrubs from 4-13' tall. Hardiness: Zones 6-9 that should be protected from frosts. Uses: Fuchsia fruits can be eaten fresh but can be tart. They are sometimes made into jams and jellies. Continue to 26 of 61 below. Fruit: Each .75" fruit is green and round. They are drupes, having one seed (pit). Size: It can grow 5-30' tall. Hardiness: Zones 10-11. It can handle some light frost with protection. Uses: The grosella fruits are generally too sour to eat but can be cooked for use in drinks, sauces, and jellies. It will turn bright red when cooked. Continue to 27 of 61 below. Fruit: The green, heart-shaped fruit is covered in soft spines. It is 4-12" long and can weigh as much as 10-15 pounds. It is related to the cherimoya, custard apple, and sweetsop. Size: This tree grows to 25-30' tall. Hardiness: In the U.S. guanabana can only be grown in Southern Florida, Hawaii and Puerto Rico. Uses: The guanabana is made into ice cream, sherbet and drinks. Some varieties do not have fiber and can be eaten fresh. It is high in vitamins B1, B2 and C.
Continue to 28 of 61 below. Fruit: The 2-4" are round with light yellow or green skin. They have a very strong, sweet smell. The pulp inside can be white, yellow, or light/dark pink. Size: The standard size is 10-15' tall, though it can grow as high as 30' tall. Uses: The guava can be eaten fresh or used in drinks, desserts, and more foods. Continue to 29 of 61 below. Latin Name: Myrciaria spp. There are four species whose fruit is called jaboticaba. Fruit: The round jaboticaba fruits range in size from .25-1.5". They can range in color from green to dark purple. The pulp inside is white or pink. Size: These trees grow from 10-40' tall. Propagation: Grafting and seeds. Trees from seed can take up to 15 years to start producing fruit, so grafting is preferred. Uses: The jaboticaba is eaten fresh or made into jellies, jams, and juices. They should be peeled to lessen the amount of tannin. Continue to 30 of 61 below. Native to: Indian and Southeastern Asian rainforests. Fruit: The jackfruit is the largest edible tree fruit in the world. It is 1-2' long and can weigh as much as 75 pounds. The spiky skin is yellow-green. The pulp inside is yellow. The jackfruit will sometimes have an unpleasant smell. The jackfruit is related to the breadfruit and the marang. A distant relative is the fig tree. Size: The tree can grow over 90' tall. Propagation: Seeds (which can take up to 8 weeks for germination). Grafting is also used. Uses: The jackfruit is often eaten fresh or used in food dishes. The seeds are also edible and may be boiled or roasted. Continue to 31 of 61 below. Fruit: The red drupes are about 1-2.5" long, depending on the cultivar chosen. Jujube can have a taste similar to apples or dates, depending on how ripe they are. Size: The jujube tree can reach 40' tall. Hardiness: Zones 5-10. The jujube has a surprising tolerance to some cold. Uses: Jujubes can be eaten fresh, dried, or used as an ingredient in desserts. Continue to 32 of 61 below. Fruit: Kei apple plants are dioecious and often require both male and female shrubs. Sometimes fruit may be produced without pollination (parthenogenesis). 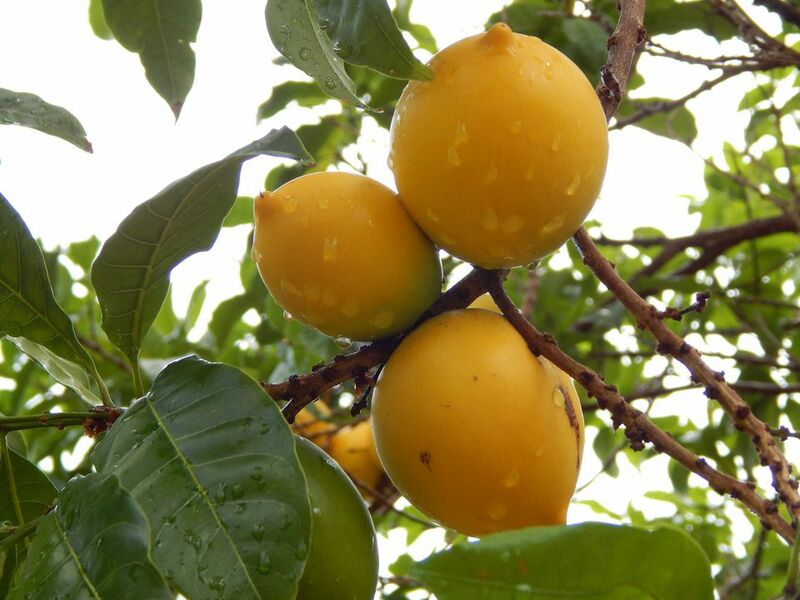 The fruits are yellow, 1-1.5" and round, and are abundantly produced on the branches. Size: The Kei apple grows to 30' tall. Uses: The fruit is a great source of Vitamin C. It is often too tart to eat fresh, though some eat it with sugar. It is used to make jellies and desserts. Care should be taken when planting a kei apple as it has allelopathic effects on other plants. Continue to 33 of 61 below. Native to: China (it was introduced to New Zealand by missionaries). Fruit: The oval fruits (up to 2.5" long) have a fuzzy brown skin. The inside is often a bright green color, though it can also be yellow, brown or off-white. The kiwi fruit is dioecious and both male and female plants will be needed for fruit. Size: The woody vines can be as long as 30'. They should have support, such as a fence or trellis. Uses: Many kiwi fruits are eaten fresh. They are also used for drinks, desserts, and flavors. They are a good source of nutrients, being high in Vitamins A, C and E. They are also a good source of potassium. Continue to 34 of 61 below. Fruit: The 1" longan fruits have a thin, leathery skin that is very easily removed. Inside, white pulp surrounds a single black seed. The longan is related to the ackee, lychee, and rambutan. Size: The longan tree can grow to 40' tall. Uses: The longan fruit is usually eaten fresh and is also used in many desserts and drinks. Continue to 35 of 61 below. Size: The loquat tree grows 20-30' tall. Uses: Loquats can be eaten fresh or used in desserts. If they are picked just before ripening, they will have enough pectin to make jelly. Continue to 36 of 61 below. Fruit: The 1-1.5" pink/red lychees are borne in clusters of 4-50 fruits. The outer skin can be easily removed, revealing white flesh surrounding one brown seed. Size: The lychee tree grows 20-40' tall, and up to 100' tall in the wild. Lychee is related to ackee, longan, and rambutan. Propagation: Air-layering, grafting, and seeds (will not be true to cultivar). Uses: Lychee can be eaten fresh, dried, or used in desserts. Continue to 37 of 61 below. Fruit: Mamey is 4-8" brown-skinned berry. The orange pulp inside has a strong, pleasant smell and tastes like apricots or berries. Size: The mamey tree can reach 75' tall. Uses: Mamey is often eaten fresh, either alone or in salads. It is also made into many desserts such as ice cream. Continue to 38 of 61 below. Fruit: The 2-9" mango fruits have a skin that is either green or yellow/red when ripe, based on variety. The mango is related to the cashew apple, both of which are in the sumac family. The mango skin can cause allergic attacks in some people. Size: The mango tree can grow to 75' tall. Propagation: Grafting. Seeds can work, but will not be true to variety. Uses: Mango is eaten fresh, usually after peeling, as the skin is toxic for some people. It is also used in a wide variety of dishes. Continue to 39 of 61 below. Fruit: The mangosteen is 1.33-3" wide with purple skin. Inside are 4-8 segments of white pulp. Many call this the most delicious fruit of all and name it as the "queen of fruits". Size: The mangosteen tree grows 20-82' tall. Propagation: Mangosteens are difficult to propagate. They reproduce asexually as the "seeds" are a kind of embryo instead of a true seed. They should be planted right after removal from the fruit. Other methods of propagation usually do not work. Uses: Mangosteen is called the "Queen of Fruits", and is said by many to be the most delicious fruit of all. The mangosteen is usually eaten fresh. It is said to have many health benefits but research is inconclusive. Continue to 40 of 61 below. Fruit: The marang is yellow-brown, 6-8" long and covered with spines that harden as it ripens. The flesh inside is white. The fruit, as the Latin name suggests, smells pleasant. The marang is related to the breadfruit and jackfruit and is distantly related to the fig tree. Size: The marang tree grows about 80' tall. Uses: The marang is eaten fresh. The seeds can be boiled or roasted. Continue to 41 of 61 below. Fruit: The 1" red berry has no taste. It is eaten for its effect on the taste buds. Size: The miracle fruit can grow to 15' tall. Uses: The miracle fruit is in high demand because of a curious property it possesses. When it is eaten, the taste buds are changed. Sour and bitter fruits can be eaten and they will taste sweet. The effect lasts anywhere from 30 minutes to 2 hours or more. In Japan, the miracle fruit is made into tablets that can be eaten with sour or bitter foods. They say it is a way that diabetics can have sweet foods without the sugar. Continue to 42 of 61 below. Fruit: The 8-10" monstera is covered in green hexagonal "tiles" that will fall off when it is ripe. The fruit needs at least 1 year to ripen. Until then it contains too much oxalic acid, which is quite harmful. The flavor is described as a combination of banana, pineapple, and mango. Size: The monstera can grow over 40' tall. Hardiness: Outside, zones 10-11. It is a popular houseplant in other zones. Uses: It can be eaten fresh or used in ice creams and drinks. Continue to 43 of 61 below. Fruit: The .5-.75" dark purple fruits are a type of fruit called aggregate drupes. In the botanical world, all raspberries and blackberries are not true berries. Size: The Mysore raspberry grows 8-15', taller than the common raspberry. Hardiness: A full-grown shrub can survive temperatures as low as 20°F or even a bit lower. This is a tropical raspberry that is able to grow in higher heats than the common raspberry. Uses: The Mysore raspberry can be eaten fresh and be used in many desserts. Continue to 44 of 61 below. Uses: The natal plum can be made into jams and jellies. Continue to 45 of 61 below. Fruit: The 4-5" white fruits have white, smelly pulp. Size: The noni grows 10-20' tall. Hardiness: Needs tropical location. Can withstand 35-40°F temperatures for short periods. Uses: The noni is used in a variety of juices and nutritional products for its medicinal properties. Some are scientifically proven, with many others unproven. Continue to 46 of 61 below. Other Names: Tree melon. In Australia, it is called pawpaw, though it is not the same as the pawpaw found in the U.S. and elsewhere. Fruit: Hawaiian papayas have yellow skin when ripe and orange or pink flesh, while Mexican papayas have green skin and can have yellow, orange or pink flesh. Mexican papayas are much larger than the Hawaiian papayas and can be over 15" long. The seeds are edible. Size: The papaya plant grows 10-12' tall. Uses: Papaya can be eaten fresh or used in many kinds of foods. The fruit and leaves contain papein, which can be used to tenderize meat. Continue to 47 of 61 below. Fruit: The fruit is 1.5-3" long with a tough purple or yellow skin, and bright orange pulp. The yellow variety (Passiflora edulis 'flavicarpa') is called lilikoi. The lilikoi is larger and tarter. Size: The vines can grow 15-20' a year (average life: 5-7 years) and should be supported with a fence or trellis. Propagation: Seeds, which can take weeks-months to germinate. Uses: The fruit can be eaten fresh or used in a variety of drinks and desserts. Continue to 48 of 61 below. Fruit: The fruit is 2-5" long and shaped like an egg. It is a cream color with purple streaks. The pepino is related to fruits like the tomato, pepper, potato, and tamarillo. Size: The pepino grows 4-6' tall. Uses: Pepino is usually eaten fresh. It has a taste similar to melons, which is why they can be called pepino melon. Continue to 49 of 61 below. Fruit: The pineapples, up to 12" long, are what is called a multiple or compound fruit. It is made up of many smaller fruits that have fused together. Make sure the pineapple is ripe before eating as it is poisonous when immature. Size: The pineapple plant is 2-5' tall. Hardiness: Zones 9-11. Can be a houseplant in other zones. Propagation: Suckers. You can also cut off the top of the pineapple and plant it. Uses: The fruit is used fresh or in a variety of foods. The pineapple plant and fruit contains bromelain, which can be used as a meat tenderizer. The bromelain is also an anti-inflammatory, so you may eat fresh pineapple before dental work or surgeries to reduce swelling. Continue to 50 of 61 below. Other Names: Platano. There is also an unrelated family of herbs/weeds (Plantago) that are called plantains. Uses:: The plantain is much starchier than the standard banana and is used in cooking, often as a vegetable. Continue to 51 of 61 below. Uses: The seeds and pulp are eaten fresh. They can also be made into juices, desserts and other dishes. Syrup made from pomegranates is called grenadine. The pomegranate is also used for its nutritional and medicinal properties. Continue to 52 of 61 below. Fruit: The fruit is 1" wide. The red skin is covered in soft, hairy spines. The skin slips off very easily to reveal white pulp surrounding one brown seed. The texture and flavor are reminiscent of a sweet grape. It is related to the ackee, longan, and lychee. Size: The rambutan tree grows 50-80' tall. Hardiness: Zone 11. It is not frost-hardy at all. Continue to 53 of 61 below. Other Names: Jambu, Malay apple, Mountain apple, and many more. Varies by species. Fruit: The 2-4" fruits are red and bell-shaped. The flesh inside is white. There may be 1-2 seeds, or it may be seedless, depending on variety. Size: The rose apple tree can grow over 60' tall. Uses: Rose apples are eaten fresh or used in wines. Continue to 54 of 61 below. Fruit: The salak is a 2" fruit with brown scaly skin, earning it the name "snake fruit" The skin peels away easily to reveal white lobed flesh. The seed is inedible. Size: The salak palm tree grows 12-20' tall. Uses: The salak can be eaten fresh or preserved. Continue to 55 of 61 below. Fruit: The round 2" fruits have a tough brown skin. There are 5 segments inside of white pulp. Size: The santol tree grows anywhere from 50-150' tall. Continue to 56 of 61 below. Fruit: The sapodilla is 2-4", has brown skin, and can be round or oval, depending on variety. The flesh inside can be varying shades of brown. It is said to taste like a mix of brown sugar and root beer. Size: The sapodilla tree grows 60-100' tall. Uses: The sapodilla is eaten fresh. It also contains chicle, a latex that used to be used in chewing gum. Continue to 57 of 61 below. Fruit: There are two varieties of star apple. Both are 2" long. One has purple skin and pulp. The other has green skin and white pulp. Size: The tree grows 25-100' tall. Hardiness: The star apple is quite tropical and only grows well in southern Florida, on the Florida Keys and Hawaii. Uses: Star apples are eaten fresh or used in drinks, salads, and desserts. Continue to 58 of 61 below. Native to: Central America or the West Indies. Fruit: The 2-4" long fruit has creamy skin and pulp. The sweetsop is related to the cherimoya, custard apple, and guanabana. Size: The sugar apple tree grows 15-25' tall. Uses: The sweetsop is eaten fresh or used in drinks. Continue to 59 of 61 below. Fruit: The fruits are oval, 2-4" long and come in shades of purple, red, yellow and orange. The tamarillo is related to peppers, pepino, potatoes, and tomatoes. Size: The tamarillo can grow up to 20' tall. Uses: The tamarillo is eaten fresh, made into drinks, or used in many dishes. You can use it generally like a tomato. Continue to 60 of 61 below. Fruit: The 3-8" brown pods are filled with sticky brown pulp. The tamarind is distantly related to carob. Size: The tamarind tree grows up to 80' tall. Uses: Tamarind is usually used as a flavoring for drinks and desserts. It can also be eaten fresh if desired. Continue to 61 of 61 below. Fruit: The round pome fruits are around 3" and brown. Size: The Asian pear grows 30-40' tall. Hardiness: The Asian pear can be grown in Zones 5-9. Uses: The Asian pear is crisp like an apple with the taste of a slightly tart pear. It can be eaten raw or cooked.